John Cowper Powys (/ˈkuːpər ˈpoʊɪs/; 8 October 1872 – 17 June 1963) was a British philosopher, lecturer, novelist, literary critic, and poet. Powys was born in Shirley, Derbyshire, where his father was vicar of St. Michael and All Angels Parish Church, between 1871 and 1879. Although Powys published a collection of poems in 1896 and his first novel in 1915, he did not gain success as a writer until he published the novel Wolf Solent in 1929. He was influenced by many writers, but he has been particularly seen as a successor to Thomas Hardy, and Wolf Solent, A Glastonbury Romance (1932), along with Weymouth Sands (1934) and Maiden Castle (1936), are often referred to as his Wessex novels. As with Hardy's novels, the landscape plays a major role in Powys's works, and an elemental philosophy is important in the lives of his characters. In 1934 he published his important Autobiography. Powys was also a highly successful itinerant lecturer, first in England and then from 1905 until 1930 in the USA. Many of Powys's novels were written in America and his early novels, and all his major novels, up to and including Owen Glendower, as well as Autobiography, were first published in the United States. Powys moved to Dorset, England, from America, in 1934 with his American partner Phyllis Playter, but in 1935 they moved to Corwen in Merionethshire, Wales. This led to the publication of two historical novels set in Wales Owen Glendower (1941) and Porius (1951). Then in 1955 they moved to Blaenau Ffestiniog where Powys died in 1963. Powys was born in Shirley, Derbyshire, in 1872, the son of the Reverend Charles Francis Powys (1843–1923), and Mary Cowper Johnson, grand-daughter of Dr John Johnson, the cousin and close friend of the poet William Cowper. He came from a family of eleven children, many of whom were also talented. The family lived in Shirley between 1871-79, briefly in Dorchester, Dorset and then they moved to Montacute, Somerset, where Charles Powys was vicar for thirty-two years. John Cowper Powys's two younger brothers Llewelyn Powys (1884–1939) and Theodore Francis Powys were well-known writers, while his sister Philippa published a novel and some poetry. Another sister Marian Powys was an authority on lace and lace-making and published a book on this subject. His brother A. R. Powys was Secretary of the Society for the Protection of Ancient Buildings, and published a number of books on architectural subjects. Powys was educated at Sherborne School and graduated from Corpus Christi College, Cambridge, June 1894. On 6 April 1896 he married Margaret Lyon. They had a son, Littleton Alfred, in 1902. Powys's first employment was teaching in girls’ schools in Brighton, and then Eastbourne. His first published works were two highly derivative collections of poetry published in the 1890s. He worked from 1898 as an Extension lecturer throughout England, for both Oxford and Cambridge Universities. Then from 1905 to the early 1930s, he lectured in the United States for the American Society for the Extension of University Teaching, gaining a reputation as a charismatic speaker. He spent his summers in England. During this time he travelled the length and breadth of the US, as well as into Canada. Powys's marriage was unsatisfactory, and Powys eventually lived a large part of each year in the USA, and had relationships with various women. An important woman in his life was the American poet Frances Gregg, whom he first met in Philadelphia in 1912. He was also a friend of the famous dancer Isadora Duncan. Another friend and an important supporter in America was the novelist Theodore Dreiser. In 1921 he met Phyllis Playter, the twenty-six-year-old daughter of industrialist and business man Franklin Playter. Eventually they established a permanent relationship, though he was unable to divorce his wife Margaret, who was a Catholic. However, he diligently supported Margaret and the education of their son. In the US he engaged in a public debate with the philosopher Bertrand Russell on marriage, and he also debated with the philosopher and historian Will Durant. Powys was also a witness in the obscenity trial of James Joyce's novel Ulysses, and was mentioned with approval in the autobiography of US feminist and anarchist, Emma Goldman. Powys would later share Goldman's support for the Spanish Revolution. Patchin Place New York (2011) where Powys lived in Greenwich Village. His first novel Wood and Stone, which Powys dedicated to Thomas Hardy, was published in 1915. This was followed by two collections of literary essays Visions and Revisions (1915) and Suspended Judgment (1916). In Confessions of Two Brothers (1916), a work that also contains a section by his brother Llewelyn, Powys writes about his personal philosophy, something he elaborated on in The Complex Vision (1920), his first full length work of popular philosophy. He also published three collections of poetry between 1916 and 1922. Politically, Powys described himself as an anarchist and was both anti-fascist and anti-Stalinist: "Powys already regarded fascism and Stalinism as appalling, but different, totalitarian regimes". It was not until 1929, with the novel Wolf Solent, that Powys achieved any critical or financial success. In 1930 Powys and Phyllis moved from Greenwich Village in New York City to Hillsdale in rural upstate New York. One of Powys's most admired novels, A Glastonbury Romance, published in 1932, sold well, though he made little if any money from it because of a libel lawsuit. Another important work, Autobiography, was published in 1934. Then in June 1934 Powys and Phyllis left America and moved to England, living first in Dorchester, the setting for the final Wessex novel, Maiden Castle, before eventually moving in July 1935 to Corwen, Denbighshire North Wales, with the help of the novelist James Hanley, who lived nearby. Corwen was historically part of Edeirnion or Edeyrnion and an ancient commote of medieval Wales, once a part of the Kingdom of Powys. There Powys immersed himself in Welsh literature, mythology and culture, including learning to read Welsh. The move inspired two major historical novels with Welsh settings, Owen Glendower (1941) and Porius (1951). Margaret Powys died in 1947, and his son Littleton Alfred in 1954. In May 1955 they moved, for the last time, to Blaenau Ffestiniog in North Wales. John Cowper Powys died in 1963 and Phyllis Playter in 1982. Powys's first published works were poetry: Odes and Other Poems (1896), Poems (1899), collections which have "echoes […] of Tennyson, Arnold, Swinburne, among contemporaries, and of John Milton and Wordsworth and Keats". These were published with the assistance of his cousin Ralph Shirley, who was a director of William Rider and Son the publisher of them. In the summer of 1905 Powys composed "The Death of God" an epic poem "modelled on the blank verse of Milton, Keats, and Tennyson" that was published as Lucifer in 1956. There were three further volumes of poetry: Wolf's Bane (1916), Mandragora (1917) and Samphire (1922). The first two collections were published by Powys's manager G. Arnold Shaw. An unfinished, short narrative poem "The Ridge" was published in January 1963, shortly before Powys's death that June. In 1964 Kenneth Hopkins published John Cowper Powys: A Selection from his Poems and in 1979 the Welsh poet and critic Roland Mathias thought this side of Powys worthy of critical study and published The Hollowed-Out Elder Stalk: John Cowper Powys as Poet. Belinda Humfrey, suggests that "[p]erhaps Powys's best poems are those given to Jason Otter in Wolf Solent and Taliessin in Porius." The Oxford Book of Twentieth Century English Verse (1973) edited by English poet Philip Larkin contains "In A Hotel Writing-Room" by Powys. While he was a famous lecturer and published a variety of both fiction and non-fiction regularly from 1915, it was not until he was in his early fifties, with the publication of Wolf Solent in 1929, that he achieved critical and financial success as a novelist. This novel was reprinted several times in both the United States and Britain and translated into German in 1930 and French in 1931. In the Preface he wrote for the 1961 Macdonald edition of the novel Powys states: "Wolf Solent is a book of Nostalgia, written in a foreign country with the pen of a traveller and the ink-blood of his home". Wolf Solent is set in Ramsgard, based on Sherborne, Dorset, where Powys attended school from May 1883, as well as Blacksod, modelled on Yeovil, Somerset, and Dorchester and Weymouth, both in Dorset, all places full of memories for him. In the same year The Meaning of Culture was published and it, too, was frequently reprinted. In Defence of Sensuality, published at the end of the following year, was yet another best seller. First published in 1933, A Philosophy of Solitude was another best seller for Powys in the USA. Before Wolf Solent there had been four earlier apprentice novels; Wood and Stone (1915), Rodmoor (1916), the posthumous After my Fashion (1980), which was written around 1920, and Ducdame (1925). Wolf Solent was the first of the so-called Wessex novels, which include A Glastonbury Romance (1932), Weymouth Sands (1934) and Maiden Castle (1936). Powys was an admirer of Thomas Hardy, and these novels are set in Somerset and Dorset, part of Hardy's mythical Wessex. American scholar Richard Maxwell describes these four novels "as remarkably successful with the reading public of his time". 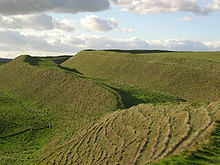 Maiden Castle, the last of the Wessex novels, is set in Dorchester, Thomas Hardy's Casterbridge, and which he intended to be a "rival" to Hardy's Mayor of Casterbridge. All the same, despite his indebtedness to the Victorian novel and his enthusiasm for Hardy and Walter Scott, as well as for lesser figures such as Ainsworth, Powys was clearly a modernist, and has affinities also with Fyodor Dostoyevsky, Friedrich Nietzsche, Walter Pater, Marcel Proust, Carl Gustav Jung, Sigmund Freud, D. H. Lawrence, James Joyce, and Dorothy Richardson. It is clear from Powys's diaries that his newfound success was greatly helped by the stability that his relationship with Phyllis Playter gave him and her frequent advice on his work in progress. A Glastonbury Romance sold particularly well in its British edition, though this was of little avail as it was the subject of an expensive libel case brought by Gerard Hodgkinson, the owner of the Wookey Hole Caves, who felt himself identifiably and unfairly portrayed in the character of Philip Crow. According to Powys this novel's "heroine is the Grail", and its central concern is with the various myths, legends and history associated with Glastonbury. Not only is A Glastonbury Romance concerned with the legend that Joseph of Arimathea brought the Grail, a vessel containing the blood of Christ, to the town, but the further tradition that King Arthur was buried there. In addition, one of the novel's main characters, the Welshman Owen Evans, introduces the idea that the Grail has a Welsh (Celtic), pagan, pre-Christian origin. The main sources for Powys's ideas on mythology and the Grail legend are Sir John Rhys's Studies in the Arthurian Legend, R. S. Loomis's Celtic Myth and Arthurian Romance, and the works of Jessie L. Weston, including From Ritual to Romance. T. S. Eliot's The Wasteland is another possible influence. A central aspect of A Glastonbury Romance is the attempt by John Geard, ex-minister now the mayor of Glastonbury, to restore Glastonbury to its medieval glory as a place of religious pilgrimage. On the other hand, the Glastonbury industrialist Philip Crow, along with John and Mary Crow and Tom Barter, who are, like him, from Norfolk, view the myths and legends of the town with contempt. Philip's vision is of a future with more mines and more factories. John Crow, however, as he is penniless, takes on the task of organising a pageant for Geard. At the same time an alliance of Anarchists, Marxists, and Jacobins try to turn Glastonbury into a commune. Caer Drewyn, Corwen, locally known as Mynydd-y-Gaer, the hill fort where Powys completed Owen Glendower on 24 December 1939. It is also an important setting in Porius. While Welsh mythology was already important in A Glastonbury Romance and Maiden Castle it became even more important after he and Phyllis Playter moved to Corwen, Wales, in 1935, first in the minor novel Morwyn or The Vengeance of God (1937). Another important element in Morwyn, is condemnation of animal cruelty, especially vivisection, a theme also found in Weymouth Sands (1934). As a result, some writers have claimed Powys anticipated the modern animal rights movement. There then followed two major historical novels set in Wales, Owen Glendower (1941) and Porius (1951). The first deals with the rebellion of the Welsh Prince Owen Glendower (A.D.1400–16), while Porius takes place in the time of the mythic King Arthur (A.D. 499). However, Arthur is a minor character compared with the Welsh Prince Porius, and the King's magician Myrddin (Merlin). In both works, but especially Porius, Powys makes use of the mythology found in the Welsh classic The Mabinogion. Porius is, for some, the crowning achievement of Powys's maturity, but others are repelled by its obscurity. It was originally severely cut for publication, but in recent years two attempts have been made to recreate Powys's original intent. It is not surprising that John Cowper Powys should, after he moved to Corwen, decide to begin a novel about Owen Glendower, because it was in Corwen that Owen's rebellion against Henry IV began on 16 September 1400, when he formally assumed the ancestral title of Prince of Powys at his manor house of Glyndyfrdwy, then in the parish of Corwen. In September 1935 Phyllis Playter had suggested that he should write an historical novel about Owen Glendower. An important aspect of Owen Glendower are historical parallels between the beginning of the fifteenth century and the late 1930s and early 1940s: "A sense of contemporataneousness is ever present in Owen Glendower. We are in a world of change like our own". The novel was conceived at a time when the "Spanish Civil War[note 1] was a major topic of public debate" and completed on 24 December 1939, a few months after World War II had begun. As we contemplate the historic background to […] the last year of the fifth century [sic], it is impossible not to think of the background of human life from which we watch the first half of the twentieth century dissolve into the second half. As the old gods were departing then, so the old gods are departing now. And as the future was dark with the terrifying possibilities of human disaster then, so, today, are we confronted by the possibility of catastrophic world events. Powys also saw the period of Owen Glendower's rebellion taking place at the time of "one of the most momentous and startling epochs of transition that the world has known". Just as the landscape of Dorset and Somerset, and the characters' deep personal relationships with it, had been of great importance in the great Wessex novels, so the landscape of Wales, especially that of the Corwen region, was now significant. The landscape and the intimate relationship that characters have with the elements, including the sky, wind, plants, animals, and insects, are of great significance in all Powys's works. These are linked to another major influence on Powys, Romanticism, especially William Wordsworth and writers influenced by Wordsworth such as Walter Pater. Powys was also an admirer of Goethe and Rousseau. Words such as mysticism and pantheism are sometimes used in discussing Powys’s attitude to nature, but what he is concerned with is an ecstatic response to the natural world, epiphanies such as Wordsworth describes in his "Ode: Intimations of Immortality", with an important difference in that Powys believes that the ecstasy of the young child can be retained by any adult who actively cultivates the power of the imagination. Some have compared this to zen and such contemplative practices, and for Powys, and the protagonists of his novels who usually resemble him, the cultivation of a psycho-sensuous philosophy is as important as the Christian religion was for an earlier generation. More minor in scale, the novels that followed Porius are characterized by an element of fantasy. The Inmates (1952) is set in a madhouse and explores Powys's interest in mental illness. But it is a work on which Powys failed to bestow sufficient "time and care". Glen Cavaliero, in John Cowper Powys: Novelist, describes the novels written after Porius as "the spontaneous fairy tales of Rabelaisian surrealist enchanted with life", and finds Atlantis (1954) "the richest and most sustained" of them. Atlantis is set in the Homeric world and the protagonist is Nisos the young son of Odysseus who plans to voyage west from Ithaca over the drowned Atlantis. Powys final fiction, such as Up and Out (1957) and All or Nothing (1960) "use the mode of science fiction, although science has no part in them". One of Powys's most important works, his Autobiography (1934), which describes his first 60 years. While he sets out to be totally frank about himself, and especially his sexual peculiarities and perversions, he largely excludes any substantial discussion of the women in his life. The reason for this is now much clearer because we now know that it was written while he was still married to Margaret, though he was living in a permanent relationship with Phyllis Playter. It is one of his most important works and writer J. B. Priestley suggests that, even if Powys had not written a single novel, "this one book alone would have proved him to be a writer of genius." And it "has justly been compared to the Confessions of Jean-Jacques Rousseau." John Cowper Powys was a prolific writer of letters, many of which have been published, and kept a diary from 1929; several diaries, including this one, have been published. Among his correspondents were the novelists Theodore Dreiser, James Purdy, James Hanley, Henry Miller and Dorothy Richardson, but he also replied to the many ordinary admirers who wrote to him. Periodically, over almost 50 years, starting with Confessions of Two Brothers in 1916, Powys wrote works that present his personal philosophy of life. These are not works of philosophy in the academic sense, and in a bookstore the appropriate section might be self-help. Powys describes A Philosophy of Solitude (1933) as a "short textbook of the various mental tricks by which the human soul can obtain […] comparative happiness beneath the normal burden of human fate". It might seem that Powys's various works of popular philosophy were mere potboilers, written to help their finances while he was working on his novels, but critics like Denis Lane, Harald Fawkner, and Janina Nordius believe that they give insight into "the intellectual structures that form the metastructures of the great novels". These works were frequently best sellers, especially in the USA. The Meaning of Culture published in 1929 went through twenty editions in Powys's lifetime. In Defence of Sensuality, published at the end of the following year, was yet another best seller, as was A Philosophy of Solitude (1933). Taking advantage of his reputation as an itinerant lecturer, Powys published in 1915 a collection of literary essays, Visions and Revisions. This was published by the manager of his lecture tours, Arnold Shaw, as was the subsequent Suspended Judgements: Essays on Books and Sensations (1916) and One Hundred Best Books (1916). Visions and Revisions went through four impressions in sixteen months. In the next thirty years he published another collection of essays, The Enjoyment of Literature (1938) (The Pleasures of Literature in the UK), and three studies of writers, Dorothy Richardson (1931), Dostoievsky (1947), and Rabelais (1948), as well as essays in journals on various writers, including Theodore Dreiser, Marcel Proust, James Joyce, and D.H. Lawrence. There is also a work on John Keats, part of which was published posthumously, and a study of Aristophanes that Powys was working on in his later years. Powys's literary criticism was generally well received by reviewers and Morine Krissdottir in her recent biography of Powys describes the essays in Suspended Judgements as "fine criticism". With regard to The Pleasures of Literature, writer Kenneth Hopkins states that "[i]f ever there was a book of criticism for the general reader, this is it". In the 1940s Powys wrote books on two of his favourite authors, Dostoievsky (1946) and Rabelais (1948). The latter was particularly praised by a number of reviewers. Rabelais scholar Donald M. Frame, for example, in the Romantic Review, December 1951, describes Powys's translation (which was only of one fourth of Rabelais) "the best we have in English". A French translation of Rabelais, by Catherine Lieutenant, was published in 1990. Powys is a somewhat controversial writer "who evokes both massive contempt and near idolatry". Thus while Walter Allen in Tradition and Dream recognises Powys's genius, he is dissatisfied with what Powys has done with it, seeing Powys's approach to the novel, as "so alien to the temper of the age as to be impossible for many people to take seriously". Annie Dillard, however, views things quite differently: "John Cowper Powys is a powerful genius, whose novels stir us deeply." What is noteworthy is that throughout his career he consistently gained the admiration of novelists as diverse as Theodore Dreiser, Henry Miller, Iris Murdoch, Margaret Drabble, and James Purdy, as well as the academic critics George Painter, G. Wilson Knight, George Steiner, Harald Fawkner, and Jerome McGann. In his autobiography, film director John Boorman wrote that he had contemplated a movie adaptation of A Glastonbury Romance early in his career. In 1958 "Powys was presented with the Bronze Plaque of the Hamburg Free Academy of Arts in recognition of his outstanding services to literature and philosophy". Then on 23 July 1962, Powys, who was 90, was awarded the honorary degree of Doctor of Letters in absentia, by the University of Wales at Swansea, where he was described as "patriarch of the literature of these islands". He was nominated for the Nobel Prize in Literature by Enid Starkie in 1958, and by G. Wilson Knight in 1959 and 1962. Powys's works have been translated into French, German, Swedish, Japanese, etc. Jobber Skald (heavily edited version of the above for UK market, 1935). Porius: A Romance of the Dark Ages (1951), restored texts 1994 and 2007. Paddock Calls, with "Introduction" by Charles Lock. London: Greymitre Books, 1984.
Letters to Henry Miller from John Cowper Powys (1975) and Proteus and the Magician: The Letters of Henry Miller and John Cowper Powys, ed. Jacqueline Peltier. London: The Powys Society, 2014 (This contains letters by both men). Thomas, Dante. A Bibliography of the Principal Writings of John Cowper Powys, Ph.D, State University of New York, at Albany, 1971. Published as A Bibliography of the Writings of John Cowper Powys. Mamaroneck, NY: Appel, 1975. ^ On the April 26, 1937, two days after Powys began his novel, the Spanish town of Guernica, was bombed by the Nazi Germany's Luftwaffe. It inspired the painting Guernica by Pablo Picasso. ^ John Cowper Powys, Autobiography (1934). London: Macdonald, 1967. The most up-to-date biographical information is found in Morine Krissdottir's, Descents of Memory: The Life of John Cowper Powys. New York: Overlook Duckworth, 2007. ^ Lace and Lace-Making. Boston: Mass., Ch. Branford, 1953. ^ London: J. M. Dent & Sons Ltd., 1929; From The Ground Up Collected Papers Of A. R. Powys by A.R. Powy. London: Dent, 1937. ^ "Powys, John Cowper (PWS891JC)". A Cambridge Alumni Database. University of Cambridge. ^ Herbert Williams, John Cowper Powys. Bridgend, Wales: Seren,1997, pp. 36, 44. ^ Kenneth Hopkins, John Cowper Powys: A Selection from his Poems. Hamilton, NY: Colgate University Press, 1964, p. 13. Autobiography (1967), p. 223. ^ Herbert Williams, John Cowper Powys, pp. 52–3. ^ Herbert Williams, p. 55, Robin Paterson, "Powys in Canada: John Cowper Powys's Canadian Lectures". Powys Notes (1994/95, p. 33. ^ Herbert Williams, pp. 77, 70. ^ Herbert Williams, John Cowper Powys, pp. 83–4. ^ Autobiography (1967), pp. 528, 550–5. ^ Morine Krissdottir, Descents of Memory, pp. 72, 86–90, 170, 298. ^ Autobiography (1967), p. 535. ^ Morine Krissdottir's, Descents of Memory, pp. 235–6; p. 212; p. 135. ^ Vision on fire: Emma Goldman on the Spanish Revolution edited by David Porter, AK Press, 2006, p. 48. ^ H. Gustav Klaus and Stephen Thomas Knight, To Hell with Culture: Anarchism and Twentieth-Century British Literature. University of Wales Press, 2005. ISBN 0708318983. p. 127. ^ C. A. Coates. John Cowper Powys in Search of a Landscape. Totowa, NJ: Barnes and Nonle, 1982, p. 90. ^ Herbert Williams, p. 97. ^ Herbert Williams, p. 109. ^ Family Search: "Edeirnion, Denbighshire Genealogy"
^ Morine Krissdottir's, Descents of Memory, pp. 370, 407. ^ See Powys's Autobiography (1967) and Descents of Memory by Morine Krissdottir. ^ Autobiography (1967), p. 338. Lucifer was published by Macdonald. ^ Review of English Literature, vol. IV, no.1, pp. 53–58. ^ "Introduction" to Essays on John Cowper Powys, ed. Belinda Humfrey. Cardiff: University of Wales Press, 1972, p. 24. ^ C. A. Coates, John Cowper Powys in Search of a Landscape. Totowa, NJ: Barnes and Noble, 1982, p. 90. ^ 1964 Penguin edition, p. 11. ^ Krissdottir, p. 37 re school. ^ Powys's first novel Wood and Stone was dedicated to Thomas Hardy. It is set on the Dorset and Somerset border. ^ "Two Canons: On the Meaning of Powys's Relation to Scott and his Turn to Historical Fiction", Western Humanities Review, vol. LVII, no. 1, Spring 2003, p. 103. ^ See In the Spirit of Powys: New Essays, ed. Denis Lane, London: Associated Universities Presses, 1990, especially the "Foreword" by Jerome J. McGann and Lane's "Introduction". ^ He published short studies of both Dostoievsky and Richardson and corresponded with Richardson; re Nietzsche, Pater, Proust, see references in Autobiography. Re Jung, see Morine Krissdottir's, Descents of Memory, pp. 267–8, and Freud pp. 403–4. ^ Morine Krissdottir's, Descents of Memory, p. 281. ^ There were five impressions of the novel in Britain, but Morine Krissdottir suggests that it was less successful in the USA, A Descent of Memory. (New York: Overlook Duckworth, 2007), p. 263. Re the libel case, see Krissdottir pp. 301–2, 304–8. ^ "Preface" to A Glastonbury Romance. London: Macdonald, 1955, p. xiii. ^ See Ben Jones "The 'mysterious word Esplumeoir' and Polyphonic Structure" in A Glastonbury Romance in In the Spirit of Powys, p. 80. ^ Krissdottir, Morine. Descent of Memory: The Life of John Cowper Powys. London: Overlook Press, 2007, pp. 252–3. ^ See Krissdottir, p. 255. ^ See Cavaliero, pp. 61-2. ^ See Wilson Knight The Saturnian Quest. London: Methuen, 1964, pp. 39-40, 52-55, 65, 74-6. ^ Richard Dudley Ryder, Animal revolution: changing attitudes toward speciesism. Berg Publishers, 2000, p. 269. ^ John M. Kistler, People Promoting and People Opposing Animal Rights: In Their Own Words. Greenwood Publishing Group, 2002, p. 161. ^ See index of Morine Krissdottir's, Descents of Memory, for this. ^ Colgate University Press, 1994, ed. Wilbur T. Albrecht, and OverlookDuckworth, 2007, ed. Judith Bond and Morine Krissdottir. ^ Herbert Williams, John Cowper Powys (Brigend: Seren,, 1997), p. 126. ^ Charles Lock, "Owen Glendower and the Dashing of Expectations". The Powys Journal, vol. XV, 2005, p. 71. ^ "Historic Background to the Year of Grace A.D. 499", Porius (2007), p. 17. ^ Powys Digital History Project: . ^ Michael Ballin, "Porius and the Dialectic of History", p. 24. ^ Michael Ballin, "Porius and the Cauldron of Rebirth", p217. ^ "Historic Background to the Year of Grace A.D. 499", p. 18. ^ '"Argument" to Owen Glendower. New York: Simon & Schuster, , p. x. ^ See especially Denis Lane, "Elementalism in John Cowper Powys' Porius. Papers on Language and Literature 17, no. 4 (1981), pp. 381–404. ^ "my great master", Autobiography (1967), p. 275. ^ Autobiography, pp. 301, 391. ^ John Cowper Powys, Enjoyment of Literature, New York: Simon & Schuster, 1938, pp. 276–308 and Autobiography (1967), p. 626. ^ For Harald Fawkner, Powys is "one of the great mystic writers of all time". "Porius and Exteriority", Powys Notes, vol.10, no.1, 1995, pp.28, 38. ^ C. A. Coates, pp. 152–3. ^ Autobiography (1967), pp. 38, 286. ^ See, for example, Harold Fawkner, The Ecstatic World of John Cowper Powys.London: Associated University Presses,1986, pp. 34-8. ^ Ichiro Hara, "John Cowper Powys and Zen". The Powys Review, vol. IIiii (no.7) Winter 1980, pp. 24–34 and Cicely Hill "'Susukeshi Hina Mo': John Cowper Powys and the Chuang-Tse Legacy", The Powys Review (no.7), pp. 34–44. ^ See Powys's Autobiography (1967) pp. 35, 414 and C. A Coates, pp. 151–3,165–9, especially. ^ C. A. Coates, p. 156; and Cavaliero, p. 133. ^ Cavaliero, pp. 131, 133. ^ G. Wilson Knight, p. 93. ^ "Introduction". Autobiography . London: Macdonald, 1967, p. xi. ^ See Morine Krissdottir, Descents of Memory, p. 289. ^ Anthony Head, "Introduction" to The Diary of John Cowper Powys for 1929, ed. Anthony Head. London: Cecil Woolf, 1998, p7. ^ See letters of Theodore Dreisser, and for Purdy, Miller, Richardson, and others in the bibliography. With regard to James Hanley, letters can be found in the National Library of Wales and Liverpool Record Office and Local History Service. ^ John Cowper Powys, "Introduction to the English edition", A Philosophy of Solitude. London: Jonathan Cape, 1933, p. 7. ^ Harald Fawkner quoted by Janina Nordius in '"I Am Myself Alone",' p. 16. Denis Lane frequently quotes from Powys's non-fiction in his "Introduction" to In the Spirit of Powys: New Essays. ^ Anthony Head, p. 7. ^ John Cowper Powys. John Keats: or Popular Paganism, ed. Cedric Hentschel. London: Cecil Woolf, 1993. Re Aristophanes see Morine Krissdottir's, Descents of Memory, p. 409. ^ Krissdottir, p. 152. For another example see Percy Hutchinson, "Adventures Among Masterpieces", New York Times Book Review, 20 November 1938, p. 2. ^ The Powys Brothers: A biographical appreciation. Southrepps, Norfolk: Warren House Press, 1967, p. 228. ^ Quoted by W. J. Keith "John Cowper Powys and Rabelais". la letter powysienne, no. 20, Autumn, 2010, p. 38. ^ Quoted by C.A. Coates, p. 175. ^  David Thomson, "Making masterpieces": a review of John Boorman's Adventures of a Suburban Boy. The Guardian, Saturday 13 September 2003. ^ "Introduction" to Powys to a Japanese Friend: The Letters of John Cowper Powys to Ichiro Hara, edited Anthony Head. (London: Cecil Woolf, 1990), p. 13. Wikimedia Commons has media related to John Cowper Powys.